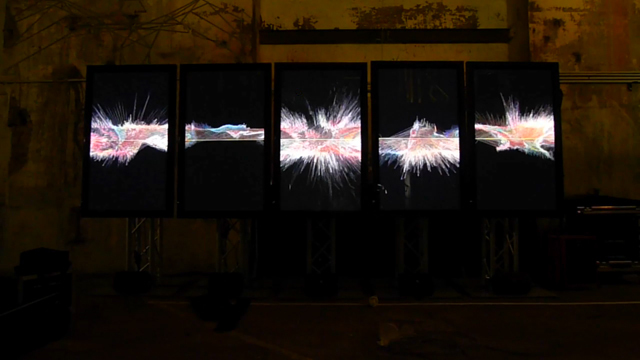 Ryoichi Kurokawa creates stunning audiovisual work for music concert and installation settings. His aesthetic has a recognisable visual and sound, although that aesthetic does appear in lots of other visual and sound approaches by other artists working at this time, one can still recognise Kurokawa�s work. I did a bookmark type blog post in 2009 about his work. Revisiting his work and examining the documentaiton on his website (a really lovely experience in itself), his work has really developed in the interim period and in particular what is of note is his use of the display in his work in which he arranges in unusual positions. For example, in rheo: 5 horizons, the 5 HD plasma displays are arranged not horizontally but vertically and in sequence, each of these displays are fed a channel of video and there is 5 channels of sound. His recent work unfold (2016), consists of three projections arranged in a curvature presentation, so that the arrangement comes towards the spectator in some way, like a type of awning and shelter. This work consists of three channels of video and 6.1 channels of surround sound. 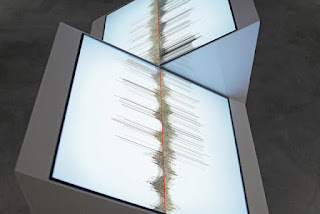 He has created an audiovisual sculpture with an unsual arrangement of displays, in his work oscillating continuum (2013), here they are arranged in a parallelogram base, each channel of video is like a structure that has an audiovisual aesthetic attached to it. SSuch precise combination of channels of video and channels of sound, results in the work emerging from the whole of these separate channels. Each video channel has its own audio precisely aligned to it, and so when the video channels are played as intended in concert, one gets a sense that what is happening is a new type of orchestration. Each channel representing its own audiovisual unit, but one can have from one audiovisual unit up to as many as one can manage to make. There is a simplicity of form in this approach, but in my opinion, there is a beauty in this simplicity. Parts link to parts and the parts link to the whole and the whole acts in concert. The form of his work in his aesthetic is carried through to the form of his work in using displays in this orchestrative type of way. 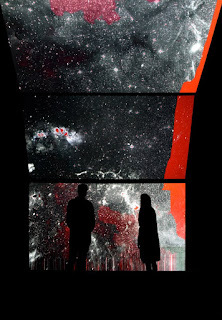 unfold from RYOICHI KUROKAWA on Vimeo. Sedition - Interview with Ryoichi Kurosawa: Synaesthetic Experience.